Thea May Campbell with a photo of her great-grandmother Marcia Barron, for whom she is named. Campbell, who teaches preschool at the JCC of the North Shore in Marblehead, also named her six-month old daughter Thea May after her grandmother. “Thea is a Greek name, and it has nothing to do with Judaism, and we just did it because I liked it, but her middle name is May, after my grandmother Marcia, who passed away,” said Campbell. 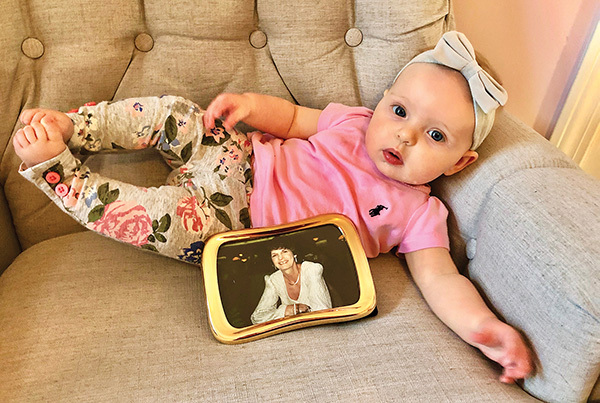 Like many other Jewish millennial parents, both Zelfond and Campbell chose offbeat names that expressed their personalities, but also honored their families and the Ashkenazi Jewish tradition of naming children after deceased relatives. Data shows that millennial parents are choosing increasingly unique names. Jean Twenge, a professor at San Diego State University, analyzed the Social Security database in detail and found that in 2015, 72 percent of boys and 79 percent had a first name outside of the top 50 most popular. Tal-Makhluf named her children according to another growing trend among American Jewish parents: turning to Israel for inspiration. Because she and her husband have strong family roots in Israel, they chose Israeli names that are also popular – and pronounceable – in the United States. 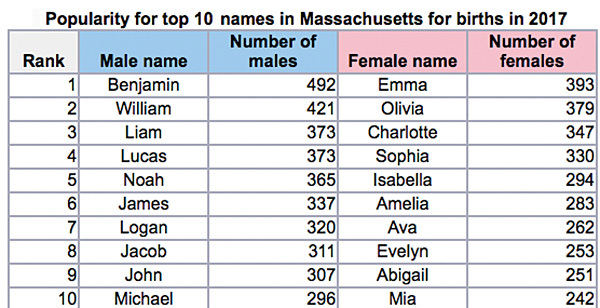 According to data from the Social Security Administration, Israeli names like Maya and Asher were the 61st and 59th most popular names of 2017, a large jump from 2000, when they were respectively ranked 113th and 579th. Jamie Greenstein, an event planner from Swampscott, named her son Aharon, the Hebrew version of Aaron. Campbell’s daughter’s Hebrew name is Simcha Yael: Simcha after her husband Robbie’s grandfather’s Hebrew name, and Yael after Campbell’s paternal grandfather, who was named Israel (in Hebrew, both names begin with the letter “yud,” and naming after the first letter is another common Ashkenazi practice.). Zelfond’s daughter’s Hebrew name is Miriam, after her grandmother. Greenstein’s son’s Hebrew name is Aharon Gedalia, after the Hebrew name of her grandfather. English middle names are often commemorative as well. Like Hebrew names, they tend not to come up often in daily life, so parents feel freer to choose names that carry emotional weight, but wouldn’t necessarily be their top choice. Campbell’s daughter’s middle name is May to honor Campbell’s grandmother Marcia. Zelfond’s daughter’s middle name is Miriam, which also honors Zelfond’s grandmother Miriam. Greenstein’s son’s middle name is Gerald, after her grandfather. Tal-Makhluf named her first child Ethan Meir because Meir was traditionally the middle name of all firstborn sons, she named her daughter Daniella Aviyah because Aviyah was a name that her late father liked, and she named her youngest son Aryeh Dov after her paternal grandfather.